Spring has sprung and it’s the start of a new Tinkering session! 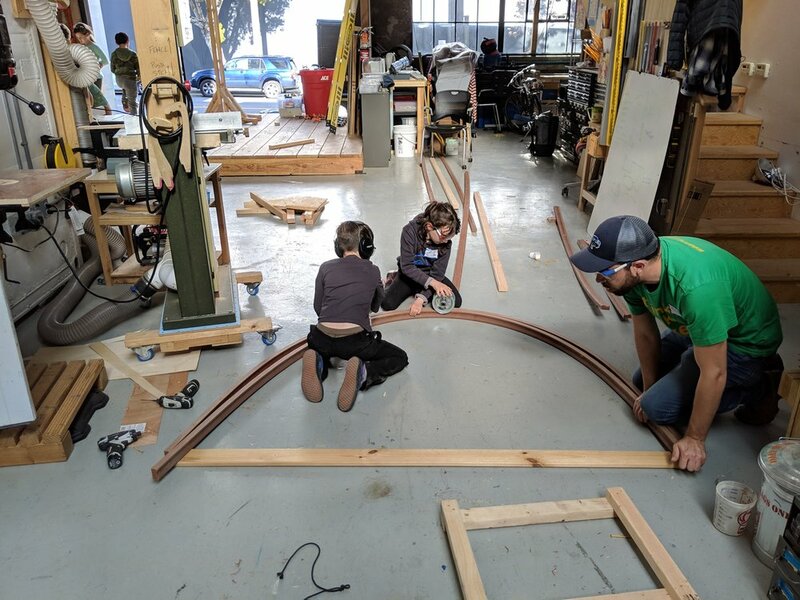 With some new faces and some familiar ones, our Spring 2019 After School Tinkerers are ready to roll….on the EXPRESS(O) TRAIN! After bringing together everyone’s design ideas and coming up with a building plan, we all got to it and made some great progress. Check out what we’ve built so far! Elliot works on attaching the final screws for the first train car’s frame. After meeting one another, going over group agreements, and completing tool training, our teams ended their first day with a design session. Elliot, Clay, and Niam take turns sharing ideas in the train car group’s design session. Bear and Willa draw out possible designs for the train accessory group. The Track team’s ideas come together. A decision is made…this train needs a coffee crane! Building begins and ideas start to take shape! The tinkerers split up into three groups for the different elements of the Express(o) Train- the cars, the track, and the coffee/cocoa crane. Along with the new coffee/cocoa theme, our good friend “Blobby Dog” has made a re-appearance as a mascot for the Express(o) Train. One of the biggest engineering challenges this team will encounter is how to keep the train wheels on the track! We looked at all sorts of wheels and talked about which ones would work best. What size wheels do we want? Do we build tracks that have a groove for the wheels to run down? Or do the wheels have sides that keep it on the track? So many options to consider. The team settled on using the metal rims without the tires because they have sides that will keep them on the track. We’ll hopefully get to test the wheels out next week! Sophie joins the group and jumps right into building tracks! 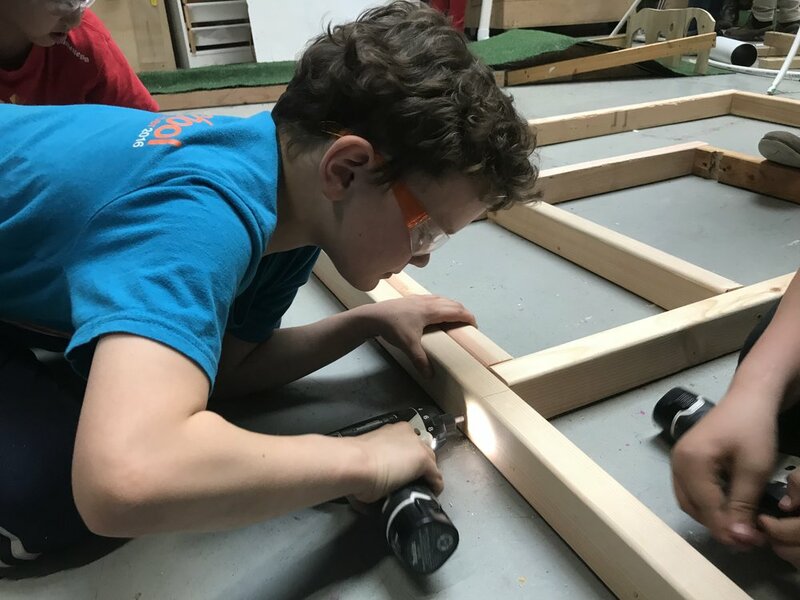 Elliot and Keira square up the corners to build their frame. We are on track! By the end of our second week together everyone was buzzing with excitement. Lily cuts 2x3” for the frame of her group’s first train car. How many people can we fit?? Lily is astonished- it’s 3 x more than we thought! This Tinkering crew is rolling! We’re jazzed to see what they’ll accomplish and create next week. Will we be able to start test riding the track? Check back soon to find out! To see more fun photos from our Tinkering sessions, be sure to visit our Express(o) Flickr album! GAME ON! Our last week with the Boys and Girls Mission Club was a blast! All the pieces came together for a pac-man inspired obstacle course that was fun for everyone. The water and sky team finished their underwater tunnels with christmas lights, interior drawings, and reflective squishy material to complete the theme AND make it more comfortable to crawl through. From there the obstacles really came into play…once each player left the elevator-mobile the ghosts started to chase them as human pac-men! Two tinkerers controlled the pulleys to move the ghosts from the staircase, doing their best to chase and catch the pac-men as they strategically made their way through the maze. 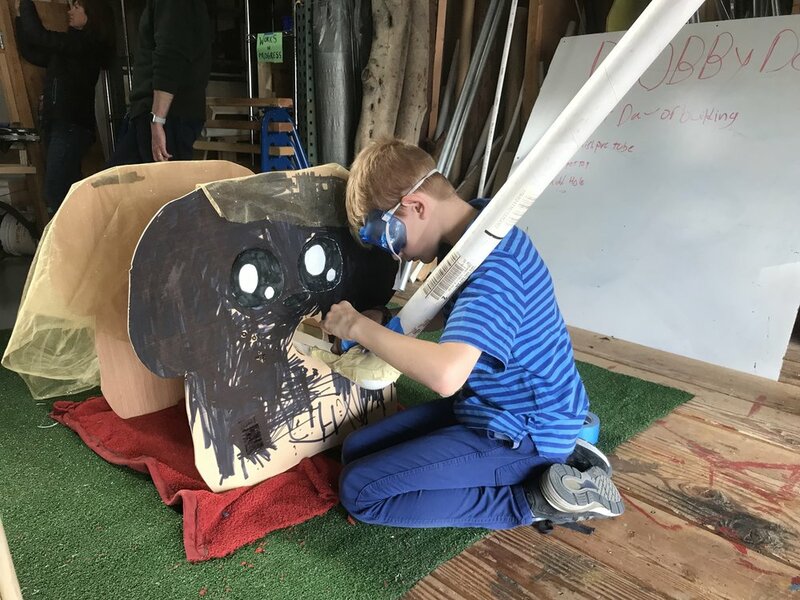 Our tinkerers came up with creative and silly ways to avoid the ghosts, but some of them still got caught! The Water and Sky team make the night sky with drills, christmas lights, and making tape. Marina drills like a pro! Edwin makes a mitered cut for the supports of the walls of the maze. Sarah and Erick work on the pac man maze. Ailey and Marina have fun decorating the inside of the underwater tunnels. First up to fly: Javier!!! Elias finds sneaky ways of avoiding the ghost by slinking and sliding on his back and belly through the maze… he wins! Anthony gets face to face with the ghost! Ailey aka “Canada” gets ready to jump on the elevator zip-line mobile from the cloud tower. A BIG thank you to all of the Mission - Boys & Girls Clubs of SF tinkerers who joined us this Winter !! To see all the photos from this epic session, don’t forget to visit our Flickr page! Parents and Families arrive for the final showcase… time to play mini-golf! 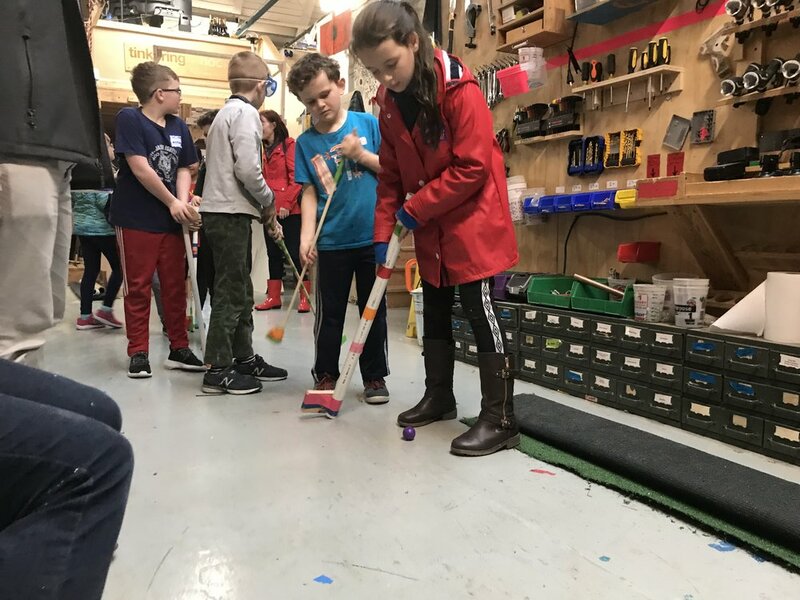 This week was our “Season Finale” and our tinkerers finally got to test out the entire exciting mini-golf course with their families! Check out the final products! The Dragon Golf team was small but mighty, joining forces to get “Bob” the dragon ready to fly! Putters started from the loft above the shop and putted a ball into a set of two large cardboard tubes. (One of which was hanging from the ceiling!) The golf ball rolled down the cardboard tubes into the Bob’s belly. Bob the Dragon then flew down the zip line and hit a stop at the top of the bridge. Whoever putted the ball had to run down the stairs in time to open Bob the Dragon’s trap door to drop the golf ball into the ball pit! Audrey and Conrad drill holes to get Bob ready to attach to the zip-line. Ava smiles big for the camera as the golf ball flies down two cardboard tubes and into the dragon’s belly!! Ava is the first to putt for the Bob the Dragon, Dragon-Golf course. “Bob the Dragon” flies down the zip-line towards the ball pit! Zane and Conrad use the trap belly door to drop the golf ball into the ball pit. Blobby Dog (and its house) came together as a two-tiered green. Putters had to climb up a set of stairs to the platform and then putted their golf ball into a tube that went from the platform down through Blobby Dog’s head onto the second putting green. 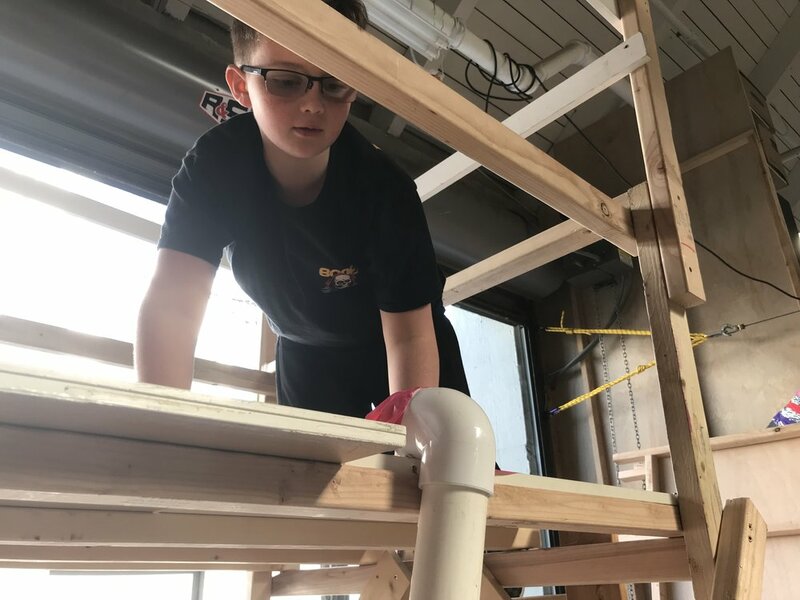 Bridger inspects the PVC pipes and connections for the Blobby Dog course… it works! Nola catches the golf ball into a cup. Success! Clay tests and repairs the last connection point for the Blobby Dog course. The Volcano Team had lots to do to complete their course in time! 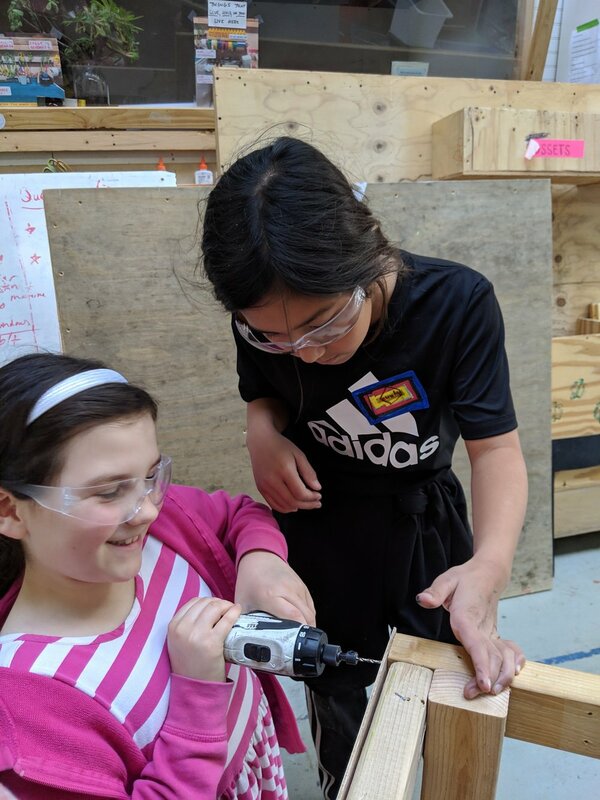 Keira and Ayana use the chuck drill to make a hole for the jig saw blade so they can cut out the most important part of the course! Owen and the Volcano team work on constructing the putting green. Success! The Volcano team was able to complete their course and then it was time for playing some mini golf! The Volcano course in action. You have to hit your gall ball into the center tunnel in order for it to be transported up the pulley powered elevator. At the top of the elevator, the golf ball is dumped into the cardboard tube for a hole in one if your lucky! Esme and Keira in an active volcano! The Mini Golf Course was such a fun and interactive project! Each team brought their visions to life and everyone (collaborators, tinkerers, and their families!) had a great time getting to play the course and test their putting prowess. A big thank you to all our hardworking and enthusiastic tinkerers who participated in the winter after-school session! To see more exciting photos from each week, please visit our Mini Golf Flickr album. See you next time! Only one more week to go and our teams are on a roll!!! The “Boss Toss” team now has a claw machine that is fully operational. Next step is to finish the life-size maze underneath!! Vassidy, Anthony, and Erick work on installing the Boss Toss pulley. Vassidy, Erick, and Jazmine worked hard installing lines and pulleys to the giant frame so it can move forward and back. They also attached lines that will pull the smaller cart laterally across the frame. The result? Just like a candy claw machine, this jumbo version can move position itself in any direction! The water and sky team made lots of progress on their tunnels. They attached the hinges for their trap door, plywood sides, and even a roof! They are excited to work on their themed “underwater/bubble” and “night sky” decorations next! Soon they will be combining their decorated tunnels to the rest of the video game maze :) We can’t wait to see how it turns out! Ailey uses the jigsaw to cut sides and ends for the tunnels. We make the night sky happen!!! The Water and Sky team drilled holes in the roof of one of the tunnels to make in look like a starry night from the inside. Most projects morph , change, and become modified through the building process. The “Can’t Touch the Ground” team’s creation is a great example of that. Their original idea was more like an elevator that moved up and down. 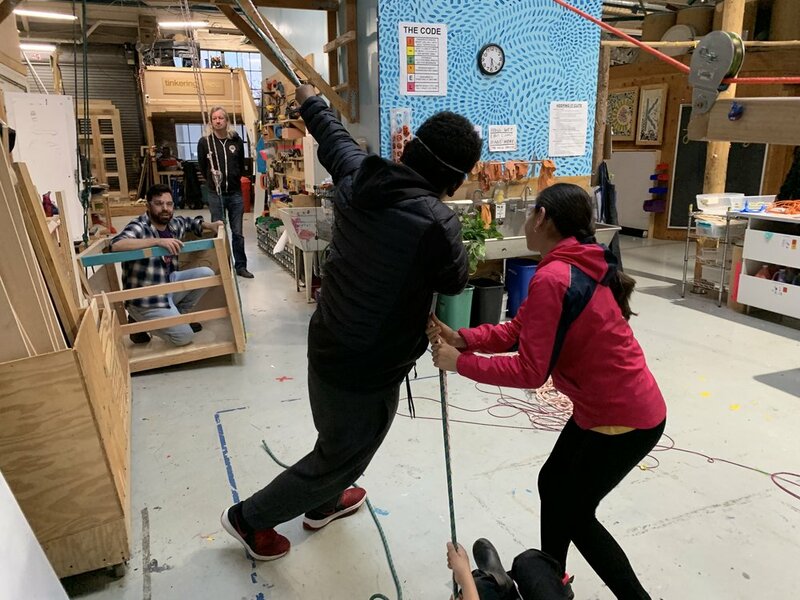 But after seeing the zip line that’s installed inside the shop, the elevator was happily transformed into the perfect zip-line mobile! They attached a sliding door and now it is set to fly! Luckily we were able to re-purpose another after school group’s tower creation. 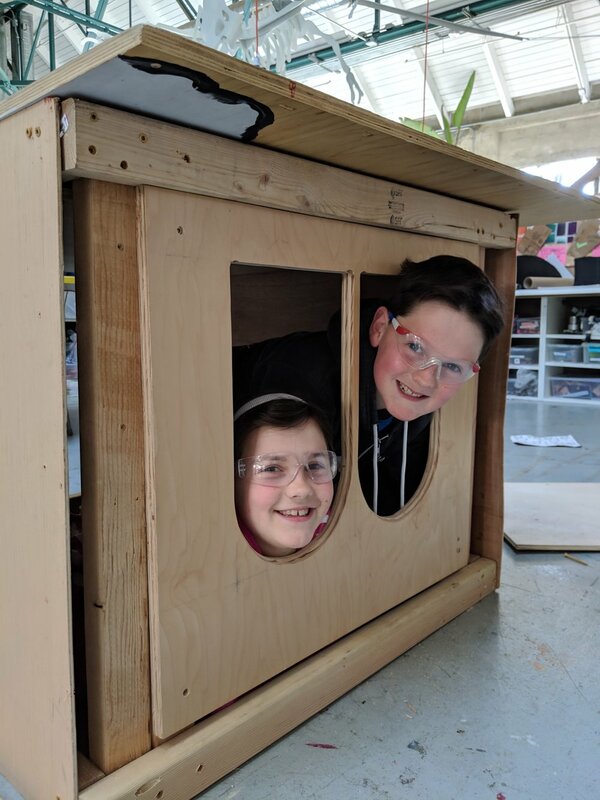 It happens to be just the right height for our tinkerers to climb up on and get into the modified zip-line elevator mobile! The end of this week’s session was spent giving everyone a turn flying down the zip-line. So fun!!!!! Finally we get to test the zip-line!!!! Fernando is all smiles. This week concluded our 8 week long session at Willie Mays Boys and Girls Club. 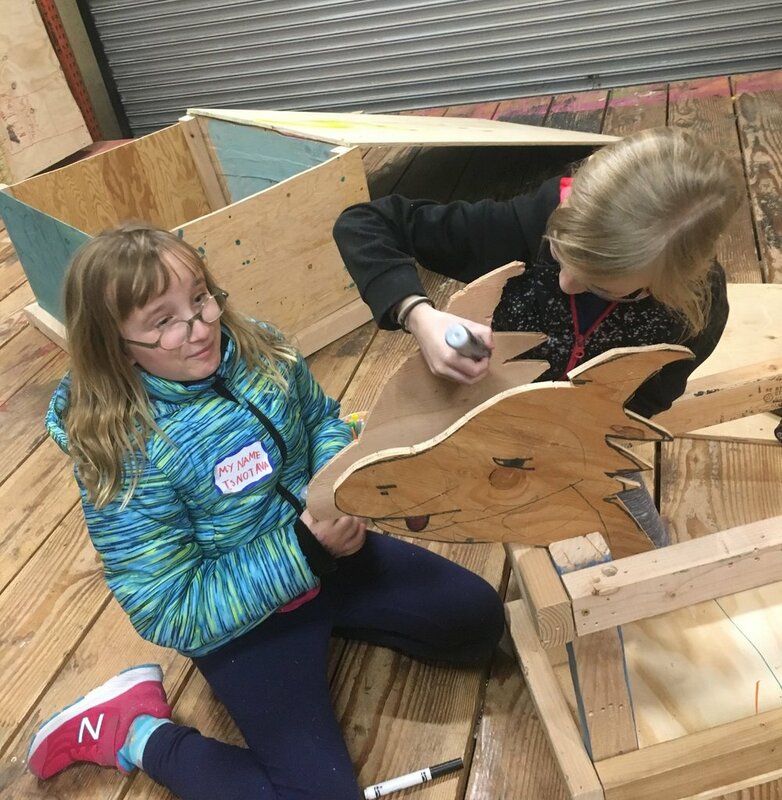 It was an exciting journey from start to finish, and we ended it on a high note with a thrilling train ride that our tinkerers built themselves! 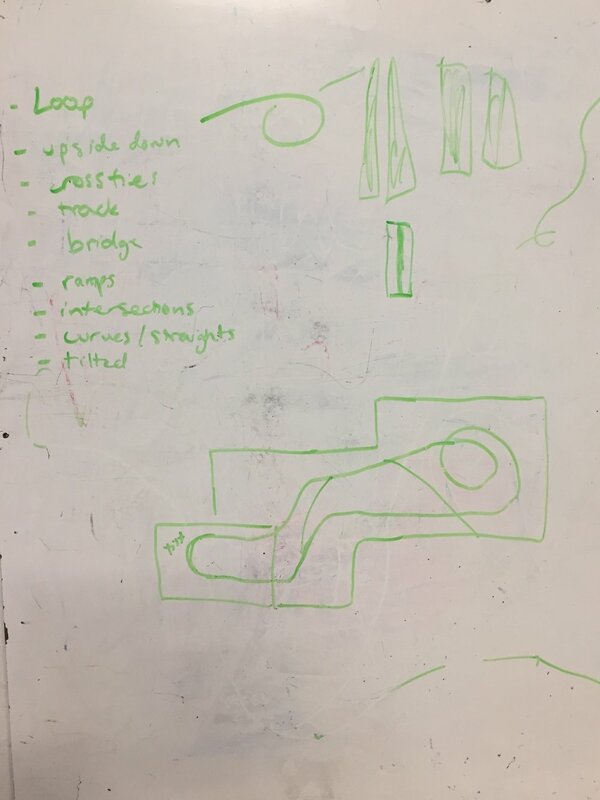 At the final session we broke up into three groups to finish our main project elements: The tunnel, the train car, and the track (complete with ramp!) We had a lot of parts that had to fit together in order to work well and keep the train moving along. MaKai and Anthony make adjustments to the base of the train car. This project was a great example of making multiple iterations and testing, then re-testing. During the last two sessions the tracks had to be modified and cut down, the axles had to be replaced and re-adjusted, AND we had to move/adjust the wheels multiple times… but we did it and it worked! Dallas works on the tunnel. The train car is ready to go down the tracks!!! Dallas uses the jigsaw to cut pieces for the train car sides. The train car is coming together! The whole group works on it together while Brendon holds the sides in place. Everything came together in the end and we had a blast testing it out! D’Nya is about to test it out!! The Tinkering School staff had a blast collaborating with everyone at Willie Mays Boys and Girls Club. Thank you for a great winter session!! To see more fun photos from each day of tinkering, be sure to visit our Flickr page!